You might have heard on the internet that now you can make money by typing captcha in the required field. Most people think that these websites are scams, its not scam because in Pakistan majority people works on it and made good payment through it. 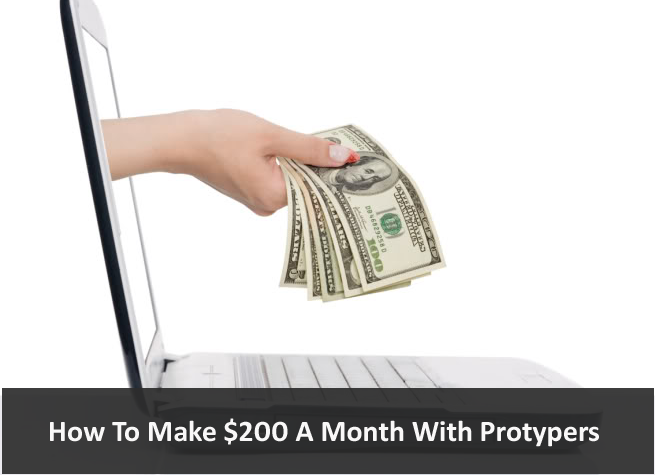 You can earn atleast $1 per thousand words. This payment may not seem enough to you, but i personally think that for such kind of work its suitable. You will be just given words & numbers in the image and your work will be to type it in the box. According to me its the easiest job available on the internet. 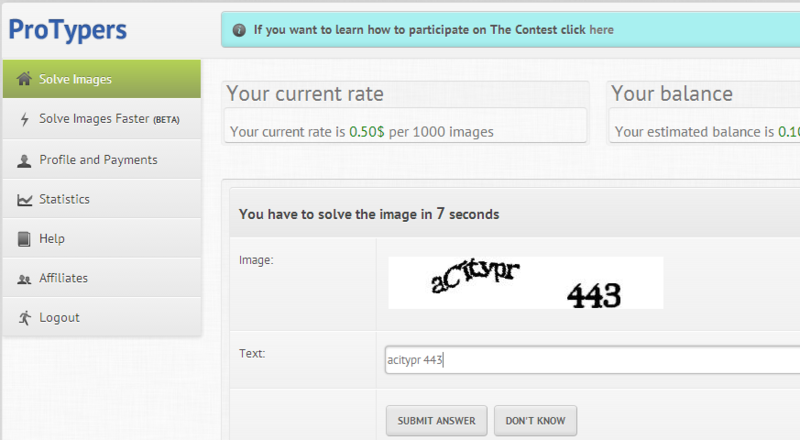 I have worked on many Captcha entry websites but was not satisfied with them. I am only satisfied with one network and that is ProTypers, because it has best features. Protypers work is same for all the workers but there is differences in payment. It has different payout rate for each hour, i mean that the payment is not fixed it may increase or decrease after each hour. 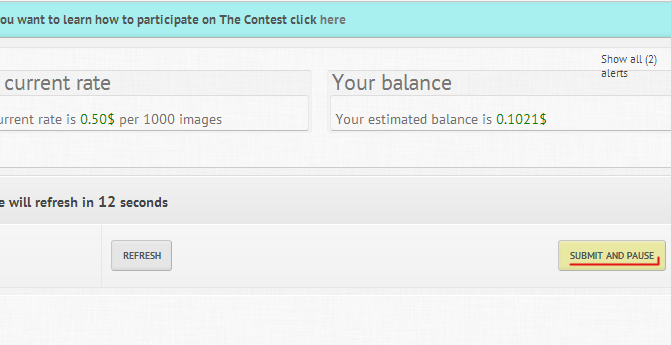 When you login to your account, payout rate will be shown above. It pay you from $0.50 to $1.35 per 1000 words. You can earn upto $200 dollars a month depending on you that how much time you give to it, the more time you give the more you will earn. You can make it your part time job or full time job, there is no specific time for work. 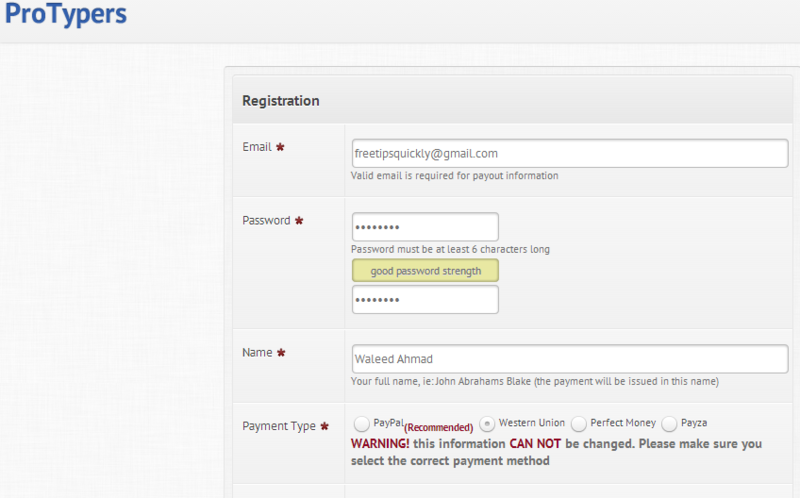 Sign up method is too simple, you have only to fill the required fields ( including Email, Password, Name e.t.c). For payment type you need an account of PayPal, Perfect Money or you can get money through western union. You should be more conscious about Payment Type because once you choose it and register your account then it can not be changed. When you are login you will be shown a page, to start work click on Solve Image button. Now images will start appearing but sometime it may take few seconds, so wait for it. 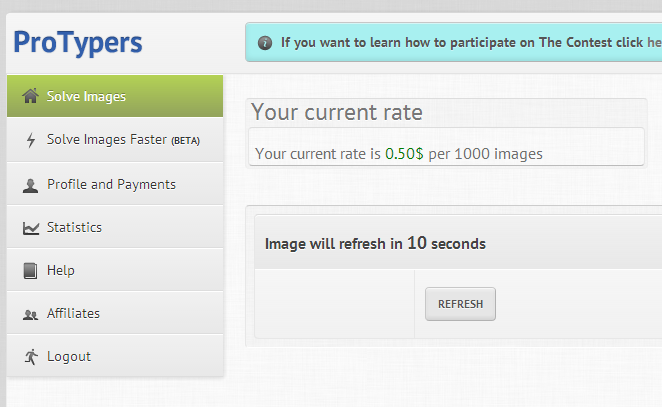 The current rate per image is shown above along with your balance, due to this feature you can easily moniter your balance and rates. If you are tired of doing work and want do some rest, click on Submit & Pause button to pause the work. You can not pause work with any other way. ProTypers also provide a contest for their workers. They have arrange prizes for the winners in each contest, therefore its beneficial for the workers. ProTypers will automatically show checkbox before starting contest, which will asks you in order to participate in coming contest select Yes. You get your payment through following.